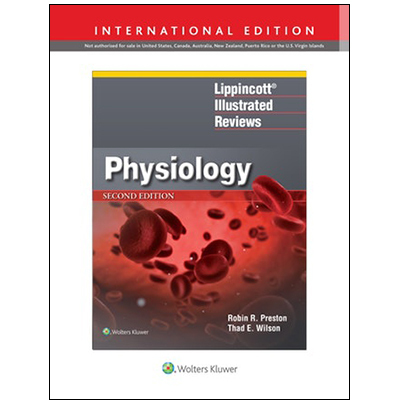 Enhanced by a new chapter, new illustrations, and new Q&As, Lippincott ® Illustrated Reviews: Physiology, Second Edition brings physiology clearly into focus, telling the story of who we are; how we live; and, ultimately, how we die. By first identifying organ function and then showing how cells and tissues are designed to fulfill that function, this resource decodes physiology like no other text or review book. Tailored for ease of use and fast content absorption, the book’s outline format, visionary artwork, clinical applications, and unit review questions help students master the most essential concepts in physiology, making it perfect for classroom learning and test and boards preparation. New content on the impact of normal aging on organ function brings the book thoroughly up to date. Review questions with explanations for each system help prepare students for course and board examinations. Five online animations explain complex concepts in a memorable way. Cross references and Infolinks to topics are keyed to page headers to expedite location and are also provided for topics in other books in the Lippincott ® Illustrated Reviews series to help students develop an interdisciplinary grasp of key concepts.